It’s been a quarter-century since George H.W. Bush was elected president, but the wheels of history are finally turning his way. 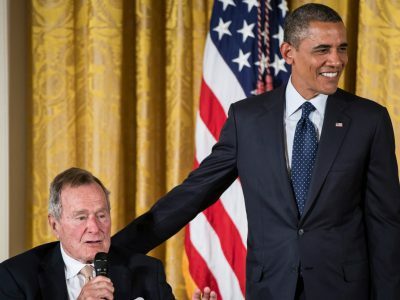 In a triumph of civility and character over hyperbolic hyper-partisanship, Bush 41 was honored Monday by President Obama at the White House for the success of his Point of Light award for civic volunteerism. We begin to see clearly in the rearview mirror of history, and George H.W. Bush has lived long enough to be appreciated as the Lone Star Yankee, perhaps the last unapologetically centrist Republican to enter the White House, winning California on the way to an electoral landslide. In the last few months alone, we have seen the posthumous publishing of Richard Ben Cramer’s Being Poppy, distilled from his 1988 campaign epic, What It Takes. The character of Will McAvoy on HBO’s The Newsroom identifies himself as the sentinel of liberal Republicanism—and boasts a fictitious past as a speechwriter for 41 as his GOP bona fides. A real-life former Bush speechwriter, Christopher Buckley, has been all but drummed out of the conservative clique his father did more than anyone else to help found but retains his perch as an unusually civil and lighthearted voice in often coarse and remorseless civic discourse. A sober look at the first Bush presidency shows an honorable man able to bridge the Northeastern Republican tradition with the Sunbelt conservative ascendancy of Barry Goldwater and Ronald Reagan. To borrow the old Smith Barney ad slogan, Bush succeeded the old-fashioned way—he earned it. Climbing from the oil fields of Texas after serving in World War II and attending Yale to a perch in Congress and then rebounding from a failed senatorial campaign to serve as ambassador to the United Nations, Republican National Committee chairman, ambassador to China, and CIA director successively, Bush was a team player in a narcissists’ game who believed a combination of hard work and good works would result in success. He was right. In his post-presidency, Bush 41 formed an unlikely friendship with Bill Clinton, the man who defeated him for reelection in 1992. And of course the family found vindication in 2000, making the Bushes the first family since the Adamses to pass the presidential baton between generations. But 41’s politics, at home and abroad, stand distinct from his son’s. One more thing: George H.W. Bush has become an unlikely fashion plate, defiantly owning the title as our preppiest ex-president. This last living WWII-vet Oval Office occupant chooses to show his retiree rebellion in a succession of colorful socks. This habit has gone from what must have been a hoot in the country club to a style as defining as FDR’s cigarette holder or Reagan’s cowboy hat. This flourish may not self-consciously reach for the iconic imagery, but it is surely more endearing because of its essential self-effacing modesty. The image of the Obamas honoring the Bushes in the White House does not fit established angry partisan narratives. But it reflects reality—the essential interpersonal civility of both first families as well as the patriotism that outweighs partisan bitterness when our politics are seen with a sense of perspective. That is as good a lesson as any with which to honor the presidency of George H.W. Bush.